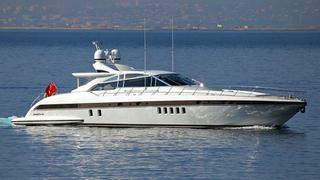 Jim Evans at SuperYachts Monaco tells me that he's signed the central listing for sale on the 24.06m Mangusta motor yacht NT, with the same owner since new and never chartered. Built by Overmarine in 2006 to a design by Andrea Bacigalupo, her leather and wood interior accommodates six guests in a master and two VIP staterooms, while twin 2180hp MTU engines with only 300 hours give a cruising speed of 36 knots. Lying in Antibes, NT is asking €1.79 million.